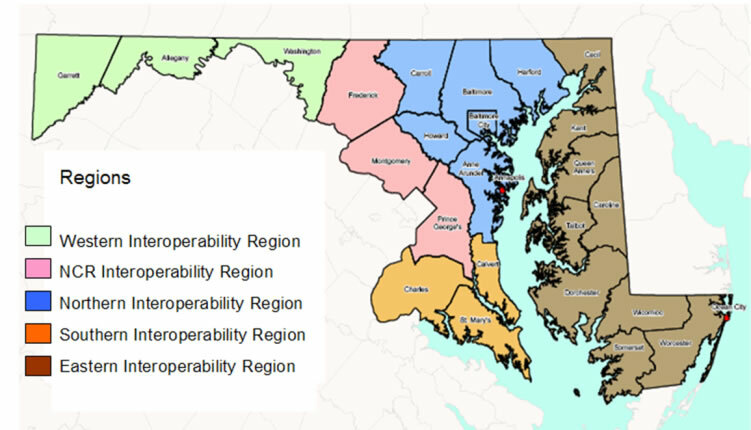 ​Maryland's Statewide Interoperablility Office is located under the Maryland Department of State Police, Secretary/Superintendent's Office. A Statewide Interoperability Executive Committee (SIEC) and Practitioner's Steering Committee (PSC) and associated committees and workgroups have been established by Executive Order and reflect cross-discipline and cross-jurisdictional representation from the public safety community. These commmittees also reflect membership from the five interoperability regions and work with each region. In addition, associations such as Maryland Fireman's Association, Maryland Police Chiefs and Sheriffs, MML, MAACO, State FOP and State Law Enforcement Officers Labor Alliance are all represented as well as State agency Secretaries and representatives and the Governor's Office. Through the Director of Maryland's Statewide Interoperability Office/Statewide Interoperability Coordinator, Maryland's interoperability program is also coordinated with Maryland's surrounding states through their SWICs, other states and terroritories across the Country and the Department of Homeland Security, Office of Emergency Communications and FEMA. ESCA (Eastern Shore Communications Alliance) consists of Cecil, Kent, Queen Anne’s, Caroline, Talbot, Dorchester, Wicomico, Somerset, Worcester counties and the town of Ocean City. For more information, visit the Program Governance tab.